Fantastic news! 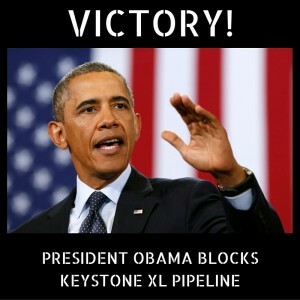 This morning President Obama rejected the Keystone XL pipeline, capping a seven-year uprising against the project, which would have carried 800,000 barrels of extreme oil from Canada to the Gulf Coast every day. All of us concerned with climate have reason to celebrate. This victory was hard fought, and it shows the growing power of the climate movement. I don’t often find myself agreeing with energy market analysts, but Ms. Tezak’s comments underscore the reality that a carbon tax that builds fossil fuels’ true costs into their price is the only lasting way to address climate change and keep those fuels in the ground. The climate movement has scored a huge win today, and we tip our hat to Bill McKibben and 350.org for helping build the movement around stopping Keystone. It was a gutsy choice against huge odds, and they stuck to it. But we need the victory to be more than symbolic, and more than a show of force. We need it to be a stepping-stone to permanence. We at CTC will be continuing to offer hard-hitting news and analysis to educate leaders in the climate movement about the urgent need to prioritize a carbon tax in their — and our — campaigning. If you agree, please take a moment to retweet this image and help spread the word. This is great news especially for environment advocates. It’s time that enough attention is given on what’s good for the environment as it affects a great number of people. Thanks for sharing this positive news. I found the Keystone decision disappointing – a missed opportunity – for the same reason that a carbon tax is a good idea. A better outcome would have been to approve the pipeline, and impose the condition that – to maintain the pipeline’s operating license – any oil that came through it would be taxed to fully repay the externalities of producing, refining, and burning that oil.